Tim Lenderking, Director of the Office of Pakistan Affairs, speaks as Prof. Creekmore and students take notes. 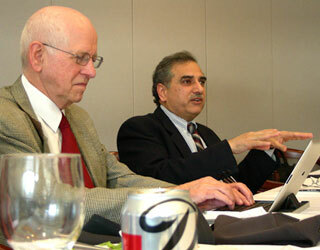 This is “a critical region and a critical time,” said Tim Lenderking, Director of the Office of Pakistan Affairs in the Bureau of Central and South Asian Affairs for the U.S. Department of State, at his presentation at Emory University on November 15, 2012. Following are some highlights from his talk. India-Pakistan relations are slowly, bilaterally, being recast with strong popular support. Since the Mumbai attacks, exchange and trade have increased and visa restrictions eased, although historical enmities still hold the region back. U.S.-Pakistan relations: Pakistan is fundamentally friendly to the U.S., but one hears much misinformation about U.S. intentions, about stealing nuclear secrets or turning the country to India. There is enthusiasm in business and journalism and a line for visas, so distrust is less. People-to-people contacts and interfaith efforts are vital. The nadir of the relationship was Nov.-Dec. 2011 after Pakistani soldiers were accidentally shot by NATO forces—an apology was necessary since Pakistan is a critical path for military supplies for Afghanistan. The U.S. has been rebuilding the relationship with modest goals, identifying shared interests, and acting jointly. We want Al Qaeda destroyed, safe havens broken, the nuclear arsenal safe, and change in Pakistan’s use of proxy groups. The spring 2013 election will be historic: the first time since 1947 for a smooth transition to elected government. Pakistan-Afghanistan relations: Some of the refugees in Pakistan since the 1979 Soviet invasion of Afghanistan are now returning. Pakistan is against the Taliban and is discouraged by extremists, but many are afraid to condemn them. Taliban prisoners were released to cooperate with Afghanistan's request to promote confidence for dialogue. Pakistan favors elections in Afghanistan (coming in 2014). The conflict will not be won on the battlefield—even some Taliban are tired of fighting! U.S.-Afghanistan relations: However, women's groups in Afghanistan fear that the situation might worsen when the U.S. leaves, so beyond the military surge, business and diplomatic surges are needed. International support is stressed. Hydro projects, roads, education—a huge commitment is needed from business, nonprofits, and interfaith sectors. And we in the U.S. can help Muslims understand that American policy is not anti-Islamic. It's up to all of us. The Consul General of Pakistan in New York, Hon. Faqir Syed Asif Hussain, spoke at Emory University on November 20, 2012 about Pakistan-U.S. relations, and Pakistan’s current and future relations with Afghanistan, India, and China. Describing what Pakistan is dealing with, Hussain noted that the Afghan insurgency has been going on for 30 years. Refugees were 5 million at the peak, and still 1.8 million in camps. The water issue has potential to destabilize the region. The Soviet Union has cooperated on the narcotics problem. And relations with America have been on a roller coaster, including threats of sanctions. The American presence is considered positive, however, and is needed for stability. If we don’t succeed, it’ll be a nightmare for Pakistan, moving perhaps toward civil war, warned Hussain, so the stakes are high and we must remain transparent. Military strategies have been in place for 10 years, but we can’t fight indefinitely—we need negotiations. explained the consul. He emphasized Pakistan’s involvement with the war on terror: being 10 years on the frontline has meant losing 35,000 lives, including 10,500 soldiers and security staff, with $80 billion losses—now $12 billion/ year. He explained that the $10-12 billion in U.S. aid to Pakistan has been appreciated: if it had not been received, Pakistan would have still deployed some troops and had costs because the war on terror is Pakistan’s war also. The question was discussed of whether Pakistan should charge the U.S. for use of air space and ground transportation, intelligence operations and air bases; however, it is believed to be better if the relationship with the U.S. remains in a spirit of cooperation rather than charging. The distribution of U.S. aid was also explained: about $500 million of aid per year has gone partly to companies supplying manufactures for the war; aid has reimbursed Pakistan for military expenses; and aid goes to civilian projects: education, health, water, energy, technology, etc., especially during the earthquake when the country really needed help. What should we do? The consul general noted that we must reinforce contacts between commanders, negotiators must meet, and religious leaders could emphasize that religion does not endorse violence. America has been asked to stop its failed use of drones: civilian lives are lost, and even if 10 foot soldiers die, 100 more decide to come because of it. On a broader view, the most important factor is lack of economic and job opportunities because if someone has nothing to eat, anyone can hire him to fight. Corruption and lack of a working judicial system breed helplessness. Religious ideology is a factor, but if you ask militants if they want to go to America, 99% do, for a better life, opportunity, fair treatment, justice. So education is a basic need. This is especially important for Afghanistan, where parliament is young and they don't have the judicial system. Give education and institutions, and it will take 20-30 years, 2 generations. In light of the impending withdrawal of most U.S. combat troops from Afghanistan in 2014, Tim Lenderking discusses the regional and national ramifications of this transition on U.S. relations with Pakistan and Afghanistan, November 15, 2012. Lenderking is the director of the Office of Pakistan Affairs in the Bureau of Central and South Asian Affairs for the U.S. Department of State. The Halle Speaker Series, a signature program of the Claus M. Halle Institute for Global Learning, brings distinguished international scholars, public policy officials, politicians, and journalists to Emory to discuss timely international topics. For more information, visit http://www.halleinstitute.emory.edu. Mr. Faqir Syed Asif Hussain, Consul General, Consulate General of Pakistan New York, discusses the status of the relationship between Pakistan and the United States. Hussain outlines the history and uses it to explain how we arrived at the relationship we have now. Faqir Syed Asif Hussain is now the Consul General for the Consulate General of Pakistan New York, but until recently was the Minister for Political Affairs at the Pakistan Embassy in Washington, D.C. He has served at the embassy since November 2006. He holds masters and LLB. In 1987 he joined Pakistan’s diplomatic service. In addition to posts in Islamabad, he has held diplomatic assignments in Egypt, Bahrain, Bangladesh, and at the Pakistan Mission to the United Nations in New York. While at the UN, he served as vice-chairman of the UN committee on the peaceful settlements of disputes. He has also been a visiting faculty member at the National Institute of Public Administration (Lahore, Pakistan), the Police Academy (Islamabad, Pakistan), and the Pakistan Air Force War College (Karachi). Asif Hussain is married and has three children.